It’s the most magical time of year! 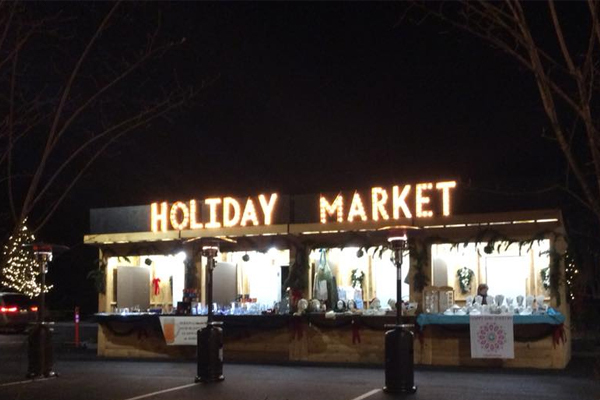 This year An Unlikely Story will hold their third annual outdoor Holiday Market at the Telford Park during the Plainville Winter Festival on Saturday, December 1st from 11am to 8pm. During the day there will be local vendors selling their merchandise and a musical performance by the Unlikely Strummers at 2pm. At night, there will be a tree lighting ceremony and Santa will make his way into the celebration riding a firetruck! There will be carolers and photo opportunities with Santa, followed by the annual holiday bonfire that hundreds of local residents attend each year. If you are a vendor interested in participating in the Holiday Market, please email Cassie at cassie@anunlikelystory.com to learn how to apply. Below is the full list of local vendors participating in the Outdoor Holiday Market. Kym- Made with Love is a local jeweler from Bristol, RI that creates beautiful chainmaille, wire and stone jewelry, accessories, and holiday ornaments. Her products range from stone and pearl jewelry to crafts inspired by superheroes and pop-culture. Kym- Made with Love accepts cash and credit. Visit Kym on Facebook and her website. Drama Kids of Metro West is a local after school program that offers unique and fun-filled drama programs across the USA and around the world to help children and young adults develop confidence, creative thinking, self-esteem, and public speaking skills. Drama Kids will do games and mini- workshops during the Holiday Market and will offer gift certificates to join. Drama Kids accepts cash, credit, and checks. See what else Drama Kids of Metro West has to offer at www.dramakidsofmetrowest.com. Creative Crocheted Items creates wonderful crocheted clothing, accessories, and household items right in Plainville. Their products include cozy gifts for every family member, including pets! They accept cash and credit cards. See their crocheted masterpieces at www.etsy.com/shop/DorisCrochetstore?ref=shop_sugg. FUNdamentallyNuts makes sweet, spicy, and flavorful nutty products, including granola and different types of nut mixtures the foodie in your family is sure to love! FUNdamentallyNuts has been in business for five years and is based in Needham. They accept cash, check, and credit cards. Visit them on Facebook or on their website. Kristin’s Creations is an artist in Attleboro. She makes original art and pendants using alcohol ink and resin. Kristin’s art can add a pop of color to any room or outfit. Kristin accepts cash, check and credit cards. Visit her Esty site to see her amazing artwork. Hemp By Harley is an Attleboro jeweler that creates unique, handmade hemp jewelry and accessories, using one hundred percent natural, sustainable, biodegradable hemp cords and nickel-free metal. They accept cash and credit cards. See more from Hemp By Harley on Facebook. Italian Decorative Art by Affanato & Company brings beautifully, handcrafted ceramics made by southern Italian artisans to New England and the upper east coast. They have been in operation for eight years and accept cash, check, and credit card payments. Visit them on their website and on Instagram. The Art of Rich Hennemann is a Franklin artist that creates phenomenally detailed, original artwork and prints. Rich’s art incorporates vibrant colors and an intensity of emotion. Rich accepts cash, check, and credit cards. See some of his artwork on his website, Facebook, Twitter, and Instagram. Simple. Pure. Bliss. is a newly founded, organic bath and body business in North Attleboro that creates products designed to help alleviate stress and bring you back to balance. Everything they create is made entirely from natural ingredients and 100% pure therapeutic grade essential oils. They accept cash and credit cards. See their products on their website. KAMArtDesign creates colorful paintings and turns them into jewelry, bookmarks, cards, and accessories locally in Norwood. They accept cash and checks. Find them on Facebook and Twitter. Artwork 4 Glassware, LLC makes sandblasted glassware by hand as well as stainless steel and ceramic items. They have been in operation for two years and create their products locally in Cumberland, RI. They accept cash, check, and credit cards. Visit them on Facebook. Avalonia Creations creates natural, hand-made soy candles using phthalate free fragrances and cotton wicks. Their scents, with ingredients like ginger and jasmine, will brighten any room. They are based in Franklin and accept cash and checks. Visit them on Facebook and on their website. A Few of My Favorite Things are based in Brockton and create lovely glass pendants and earrings, crocheted arm warmers, and crystal suncatchers. They accept cash, check, and credit cards. GG’s Pretzels creates gourmet chocolate and caramel dipped pretzel rods in a variety of flavors and with a wide range of toppings. GG’s Pretzels accepts cash and credit cards. Visit them online or on Facebook and Instagram. Frivolous Beads! creates hand beaded necklaces and bracelets, leather wrap and beaded bracelets, wood earrings, and more! Frivolous Beads! Accepts cash and credit cards.Visit their Etsy shop to see some of their designs. Dragon Fire Ventures LLC makes unique canned, stuffed critters and clothing locally in Attleboro. They accept cash, check, and credit cards. Littlelaulu creates handcrafted hand warmers, cooling and heating pads, and beautifully decorated table runners. Find special quilted patterns and more from Littlelaulu. They accept cash, check, and credit card payments. Ever Ever Afterly Arts creates whimsical flower crowns, barrettes and assorted art pieces children and young adults will love! Visit them on Facebook. Ever Ever Afterly Arts accepts cash and credit cards. Sweet V's Candy Shop is located right on South Street in Plainville and makes yummy old-fashioned candy by the pound. Find gift baskets, balloons, loot bags, and more from Sweet V’s. They accept cash and credit cards. See some of their delicious selections on Facebook. S & J Novelty are a sister duo that designs an exclusive line of children’s goods, toys, and accessories. They started their shop with “Twinkies” line of organic, cotton baby goods and now have expanded to a line of “Peter Pan” inspired soft toys, art prints, and play clothes with a storybook theme. They also have holiday themed stockings, pillows, and more. Visit them on Facebook and Instagram today! Source Fire Sauce makers, Jon and Todd are local hot sauce makers that are dedicated to using locally grown produce to find the perfect balance between flavor and heat. Choose between three different sauces or all three for a value price! Source Fire Sauce accepts cash and credit cards. Visit them online and on Instagram. Belisle Crafting hand crafts various crocheted and sewn items like book-paper necklaces and more! They accept cash and checks. Find Belisle Crafting on Facebook. Bronte Moon designs beautiful, wool scarves, wraps, and throws all made in an English mill that has been in business since 1837. All of their products are imported directly and sold in the U.S. Bronte Moon accepts cash and credit cards. Visit their website and Facebook to see their designs. Two Cubs Boutique makes homemade soaps and body care, as well as home décor, and oysters with pearls and custom made jewelry. They accept cash, check, and credit cards. Visit their website to see their designs. Calliope Crafts creates handmade, beaded ornaments in a range of styles from rustic turquoise to glittery, glass beads, perfect for the holidays! Calliope Crafts accepts cash, checks, and credit cards. Visit them on Instagram and Etsy. A Novel Idea makes handmade decorations crafted from books to give new use to a well-loved novel. They accept cash and checks. Usborne Books & More sells educational books and activities perfect for children. They accept cash and credit cards. Visit their website for more information. Trevin Jack Glass creates hand-blown and hot sculpted glass items. Visit them on Facebook to see their work. Trevin Jack Glass accepts cash and credit cards. Cindy McDonough Art is a local Attleboro artist that designs custom watercolor pet portraits and a 2019 Watercolor Dogs Desk Calendar sold with a handcrafted wooden base. They also offer gift certificates for custom work and matted prints. Cindy McDonough Arts accepts cash, check, and credit cards. Visit their website and Facebook to see their designs. Liberian Community Association of Rhode Island makes skin care and hair products, as well as jewelry and other crafts. They accept cash and credit cards. Visit them on Facebook for more information.